On January 22, 2010 To Save a Life opens in theaters nationwide. This exciting Christian film confronts many teen issues. New Song Pictures gives viewers a touching story that will certainly change the way they see people. The story is inspiring and the way it deals with the issues the characters face is remarkable. 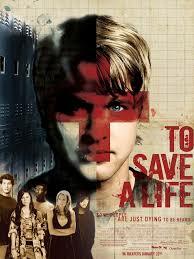 To Save a Life is the story of a teenage boy, Jake (Randy Wayne), who must make the choice to do what is popular or what is right. In the past he made the choice to be popular and it cost him a friend, literally. Now he will not let that happen again. Jake must also decide what he believes as far as God. A youth pastor, Chris (Joshua Weigel), comes into Jake’s path and he has a very unique, but effective way of dealing with the teens. Jake’s faith is tested by many difficulties, but the final outcome is inspirational. To Save a Lifediscusses difficult topics such as suicide, cutting, divorce, teen pregnancy, dating, partying, drinking/drugs, depression, abortion, adultery and more. Although it is very tastefully handled, parents and leaders should know. This is a very moving film that will help adults to understand what our teens are facing and teens to see what their actions towards others could be saying. To Save a Life is a powerful movie. It is a great film for any teen, parent, youth group, etc. I do want to warn there are some topics that might be too mature for younger kids; however most teens are aware of these issues. Today many teens are faced with issues and situations similar to those discussed in the movie and this film may be just what is needed, to save a life.